Wearable tech for monitoring health and fitness primarily remains a tool of those who are already active, but a recent PwC report suggests that the general public is beginning to understand the benefits. But the report – aptly titled Wearable Tech: Early Days – also showed signs of optimism. More than half of those surveyed believe that wearables, thanks to the capability to monitor vital signs such as heart rate and body temperature, could boost average life expectancy by 10 years. More than 40 percent also see potential for nutrition and exercise monitoring to reduce obesity, PwC says. Cost remains a barrier to entry – fewer than half of those surveyed would pay more than $100 for a fitness band – but, tellingly, two-thirds said they'd wear a band if employers or insurance companies provided them for free and collected anonymous data from the devices as an incentive to lower insurance premiums. Start talking about savings of 4 to 12 percent, says Paul D'Alessandro, principal and customer experience leader of PwC's Health Industries practice, and that's where support for wearables starts to manifest itself. Two types of people typically gravitate toward wearable tech, says Ceci Connolly, managing director of PwC's Health Research Institute, the research arm of the Health Industries group. There are those who are already active and therefore use health devices to improve athletic performance or, in some cases, as a form of self-validation. These users tend to be ages 18 to 34. There's also the sandwich generation of middle-aged adults taking care of their parents as well as their children. These users tend to be women ages 35 to 54. "We believe there's consumer demand for so many devices that help us monitor health and wellness of many family members in one convenient screenshot," she says. The big challenge, Connolly says, is encouraging wearable tech adoption among patients with multiple chronic health conditions. (It's widely reported that just 1 percent of Americans account for 22 percent of the nation's healthcare costs.) "We've got to find ways to engage them with their health," she says. One obstacle, according to D'Alessandro: Hyperbolic discounting, or the notion that the reward of a tasty cheeseburger today beats the risk of cardiac arrest decades in the future. "Building avoidance of future risk needs to happen how," he says. 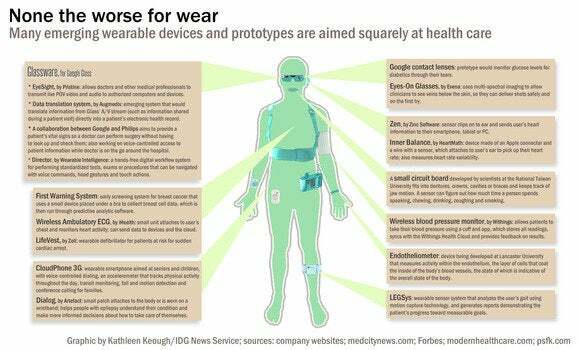 Enter wearables. At the most basic level, they can provide a "feedback loop" to congratulate a user for, say, reaching 10,000 steps or skipping dessert. This addresses today's societal need for instant gratification, D'Alessandro says. To get beyond the "early days" of wearables, though, two things need to happen. For starters, wearables must experience a "further evolution of the data that's available," beyond simply measuring activity, D'Alessandro says. More advanced devices that can gather sleep, accelerometer or even heart rate data will start to solidify wearable tech's place in remote patient monitoring efforts, he says. In addition, the data from wearable tech must evolve from knowledge to insight. For example, it's one thing to know how many steps you take, how many calories you burn and how many calories you consume. It's another thing to calculate your basal metabolic rate, or the amount of calories your body burns if it's otherwise inactive, and develop a wellness plan accordingly. Turning device data into something actionable for a patient will move wearables from their early days into larger-scale adoption, D'Alessandro says. That requires overcoming another obstacle: Getting patients to share data. Roughly 75 percent of PwC's respondents aren't comfortable sharing health data with friends and family, but 54 percent say they trust their primary care physicians with that data. "Given the right value proposition, consumers will share that information," D'Alessandro says.